On the 9th September W Bro Kevin Head, Provincial Grand Charity Steward and his wife Jo, along with Barry Hills, South West Area Charity Steward, visited the Royal Bournemouth Hospital Open Day. 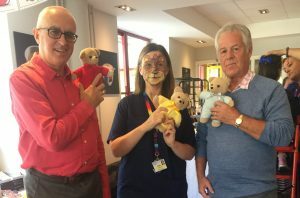 They spent some time at the Teddy Bear clinic where bears provided under the Masonic Teddies for Loving Care scheme were handed out to young visitors. The wonderful nurses there explained how the ‘Teddies for Loving Care’ scheme operated for them, and how giving a traumatised child a teddy to cuddle made such a difference. This scheme, which commenced in Hants & IOW Province during 2005, has proved to be one of the most popular charities that we support. Kevin (left) and Barry are pictured with the Paediatric Lead at Bournemouth, Elaine Wilson. The Provincial fund to supply teddies to most hospitals across Hampshire & Isle of Wight does need the occasional top up. Kevin asks our Lodges and members to bear this very worthwhile charity in mind from time to time during your meetings and Festive Boards. Further information is available through the Provincial Website.